Ladies short sleeved floral ladies blouse. Machine wash. Sizes 8-24. 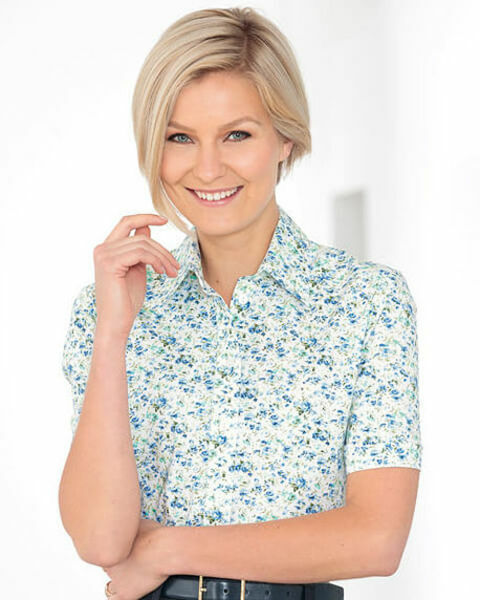 Ladies delicate floral design blouse in shades of mint, sage, pale blue and cornflower on an ecru base. Classic short sleeved style cut from pure cotton with a two-piece collar, back yoke and gently rounded hem. Mock turn back to sleeve hems. With classic tailoring and a feminine floral print this blouse is a summer essential.